Vanishing in Plain Sight. An Alzheimer's Story. The Shocking Truth About Care in Facility? There’s not a lot of care provided! By early 2005, we started getting requests to help seniors who had already surrendered their home. We began assisting facility residents all over Columbus. In 14 years, we have served in nearly every facility in Columbus, Ohio. FACILITIES DO NOT PROVIDE 24-HOUR CARE! What they do provide is 24-Hour Monitoring. If you read our blog about 24-Hour Home Care vs. 24-Hour Monitoring (click here to read) you’ll know the difference. 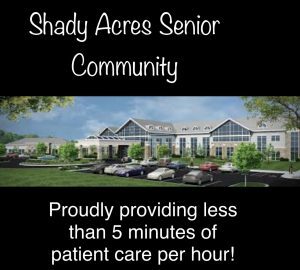 It’s amazing that Skilled Nursing Facilities in Columbus Ohio are legally allowed to say they provide 24-Hour Care! If Facilities did offer this care, we wouldn’t be needed. And if Facilities were truly providing 24-Hour care, they would pay our fees when their residents receive true 24-Hour Care. The truth is, facilities do NOT pay us. Facilities pass the costs of 24-Hour Care directly on to the families we are serving AT THE FACILITY. If your loved one is considering leaving home in favor of a facility, this will not mean that their 24-Hour needs will be met. They will NOT. Facilities DO NOT have a staffing ratio that would enable them to provide adequate care, nor comparable care to that which your loved one can receive at home. Here’s some simple math. If you are a caregiver in a facility, this is much more than a math problem. 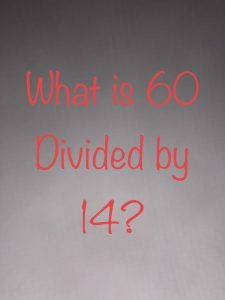 What is 60 divided by 14? This is the hard part of the equation facility staff must solve every day. Divided equally, the answer is 4.2. Four minutes is how much time each resident would receive per hour if your time as a caregiver is divided equally. But care can not be divided equally. The squeaky wheel gets the oil. The resident with more pressing needs (or the resident who’s better at pressing a care button) will invariably receive more care. We are told by former facility staff that half of their time is spent ‘documenting’ care. Ouch! Is 4 minutes of care per hour enough for someone with cognitive needs? Is this the amount of care you were told your loved one would receive during the tour of the facility you chose? Of course it’s not. But numbers like these are not exactly marketing material. They don’t pass the sniff test. This is not an appropriate solution for senior care. And yet, families are getting this amount of care, even in the most expensive facilities! As an advisor for seniors and their family members for 20 years, we have enabled solutions that fit. True care. Relationship oriented care. Care in the place of greatest comfort. Care that is truly Always There. At Always There Home Care, our clients come to experience powerful relationships with our caregiving staff. Great care begins with a great conversation. 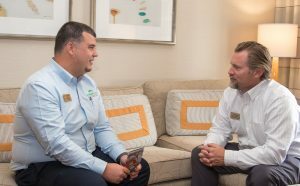 Conversations like the ones that will continue every day with your loved one and our care team. 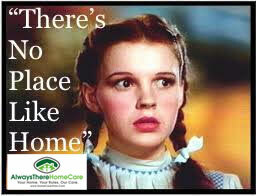 All clients of Always There Home Care get immediate access to our 24-Hour Home Care Hotline (614) HOME-CARE. This means when a crisis strikes, your loved one will NOT BE ALONE. Call us today to learn how our team can help your family. 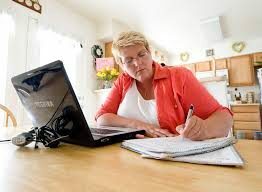 When is it time for Senior Help at Home? How to get better care at a Senior Facility. 10 steps. What kind of care does your loved one need? For whom are you looking for care? What is the care recipient’s gender?